Steeped in a rich history, our family’s company and legacy dates back hundreds of years. Recognized by The Illinois State Historical Society as one of the oldest continuous businesses in Illinois, Kennicott Brothers Company boasts a long and successful history. 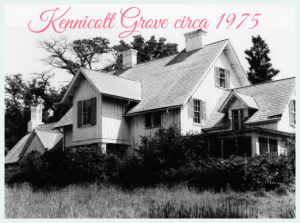 Our story begins in 1836, when the area’s first physician and horticulturist, Dr. John A. Kennicott (our great-great-great grandfather), founded The Grove Nursery by taking out a federal land grant on the Milwaukee Stage Road in Northfield Township. Soon The Grove was regularly advertising rose bushes and other floral products in the Chicago Tribune. Dr. Kennicott was instrumental in the establishment of the U.S. Department of Agriculture and promoted the Morrill Act, which established Land Grant Colleges. Also his home, The Grove is a now National Historic Landmark and nature preserve owned and maintained by the Glenview Park District. In 1881, Kennicott Brothers Company was founded by Dr. Kennicott’s sons, Flint and Amasa. It rapidly grew to serve florists in the Chicago area and eventually large portions of the Midwest and South. Chicago’s location as the rail-hub of America enabled it to become the center of flower production and shipping by the end of the nineteenth century. At one time there were more than 30 wholesalers in the Chicago market, with growers numbering in the hundreds. With the advent of air transportation in the mid 1900’s, most flower production moved to California and later to South America. Kennicott’s focus became serving local wholesale florists. Harrison Kennicott Jr., who joined the company in 1929, was the guiding force in the company’s growth, especially in the booming years following World War II. Harrison “Red” Kennicott III (aka Grandpa), officially joined the company full time in 1959, but had worked at the wholesale house since he was 12. In 1963, Kennicott Brothers Company opened its first branch store in Waukegan, Illinois, to better serve florists in that area after the North Shore Railroad went out of business. In succeeding years, locations were added in Aurora and Elk Grove (Illinois), Hammond (Indiana) and Milwaukee (Wisconsin). During the 1970’s, Kennicott briefly expanded horizontally by becoming Illinois’ largest rose grower and opening a major bouquet department to service local supermarkets. In 2012, Kennicott Brothers Company acquired the major assets of Vans Floral Products, adding locations in Alsip (Illinois), South Bend and Indianapolis (Indiana), Grand Rapids (Michigan), Minneapolis (Minnesota) and Atlanta (Georgia). We want your experience with us to be the best in the business. If for any reason we have failed to live up to your expectations, please let our management team know.